Wohoo heads up on this offering coming up! Starbucks Frappuccino Happy Hour is back! 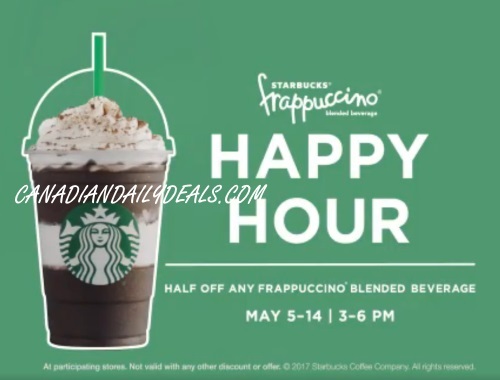 Get half off any frappuccino blended beverages! They're also promoting their new Midnight Mint Mocha Frappuccino blended beverage, good time to try it during this event! Offer is valid May 5-14, 2017 from 3-6pm at participating stores. Usually Starbucks Rewards members get extra time and extra days, I will report back when we hear anything.